الموضوع في 'قسم الكيمياء' بواسطة abu-omar, بتاريخ ‏ابريل 3, 2008. Core level spectroscopy has become a powerful tool in the study of electronic states in solids. From fundamental aspects to the most recent developments, Core Level Spectroscopy of Solids presents the theoretical calculations, experimental data, and underlying physics of x-ray photoemission spectroscopy (XPS), x-ray absorption spectroscopy (XAS), x-ray magnetic circular dichroism (XMCD), and resonant x-ray emission spectroscopy (RXES). Starting with the basic aspects of core level spectroscopy, the book explains the many-body effects in XPS and XAS as well as several theories. After forming this foundation, the authors explore more advanced features of XPS, XAS, XMCD, and RXES. Topics discussed include hard XPS, resonant photoemission, spin polarization, electron energy loss spectroscopy (EELS), and resonant inelastic x-ray scattering (RIXS). The authors also use the charge transfer multiplet theory to interpret core level spectroscopy for transition metal and rare earth metal systems. 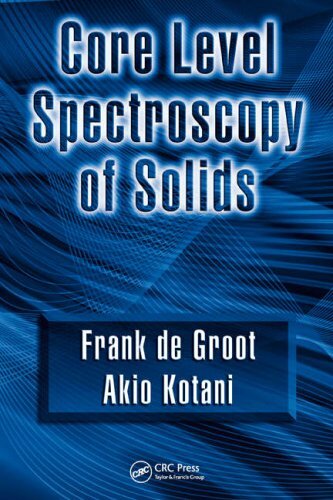 Pioneers in the theoretical and experimental developments of this field, Frank de Groot and Akio Kotani provide an invaluable treatise on the numerous aspects of core level spectroscopy that involve solids.